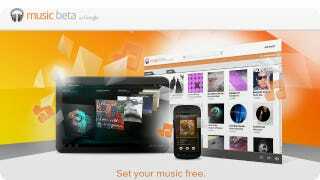 The key to Google Music's growing adoption is its deep integration with Android. It's hard to complain about a storage locker that'll let you store 20,000 songs for free, but there's a simple bug that's basically hamstringing it. -after the first track, it just stops. -from there you have to start playing the album again, and then skip the first track, and then the rest of the album will usually play all right. Sound like a minor gripe? Not if you're driving it isn't. It means five minutes after you've pulled away from the curb you've either got to pull over to restart your music or drive in stony, merciless silence. Even if you're not driving, it's just really annoying that you have to deal with it. It doesn't happen every single time, but it happens more often than not. There are user reports of it happening all over the internet, including in Google's own forums, but Google has yet to respond. Google Music is primed to go very big considering it's the default music player in Android 4.0 Ice Cream Sandwich (Honeycomb too, but who cares? ), but it definitely still needs some work. Have you been experiencing this problem or others? Tell us about them in the comments, and maybe we can make a list of fixes for the big G.